That wait, in Rupert’s case, has totalled 38 years. Rupert wasn’t always this good at waiting. In 1983, a young and impatient man was taking photography classes in London. 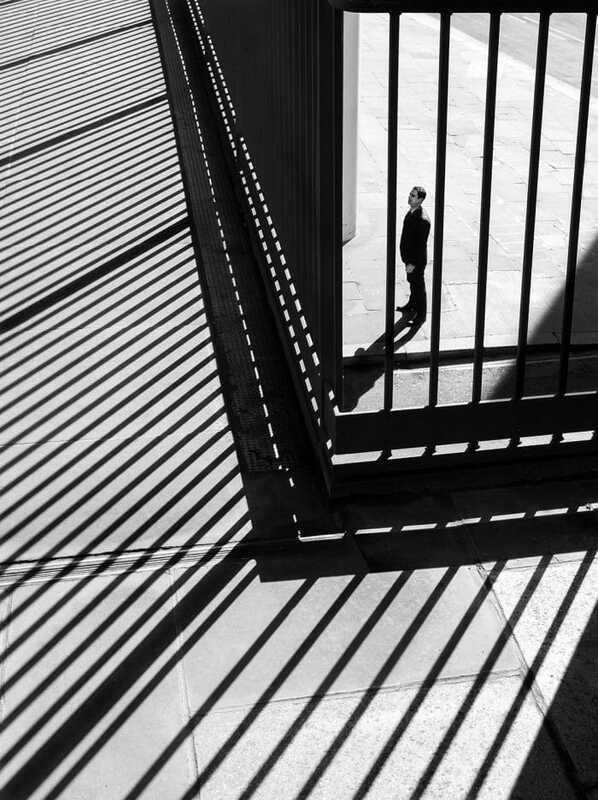 Developing a negative of the city streets, he made the rash decision to burn the shadows to an extreme. Why not? It would hardly destroy the image. As the photo developed, deep pockets of black puddled against the bright white of the highlights. The effect was extraordinary. 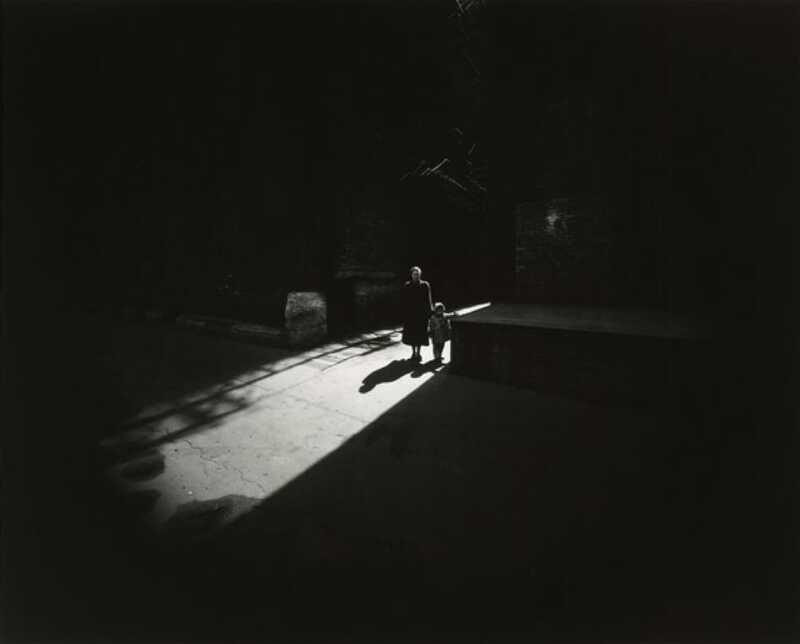 Rupert’s tutor smiled and compared it to the work of the American photographer, Harry Callahan. Unaware of Callahan’s work, Rupert bought a book and began his research. 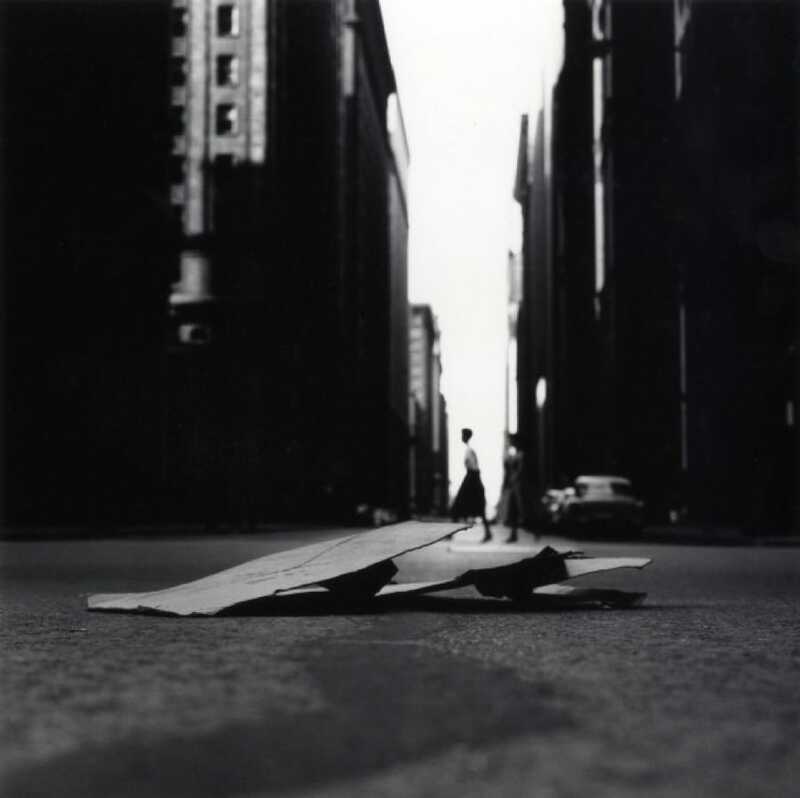 Back in the 1950s, street photographers such as Callahan and Metzker were moving photography away from the realism of the past, pushing the form toward the abstraction of the expressionist painters. Both photographers experimented with high contrast tones and multiple exposures, re-envisioning the modern city as something momentous and disempowering. Since the discovery of their work, Rupert began his own study of light. 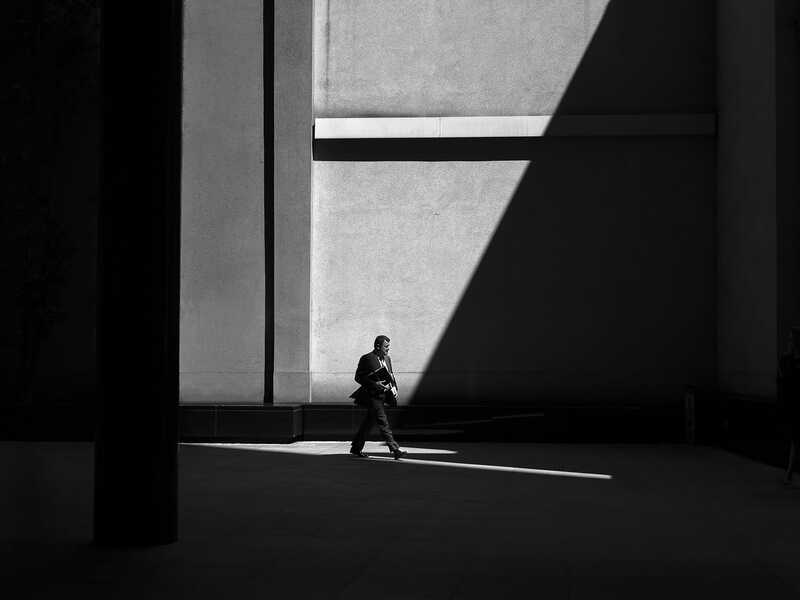 He has developed a number of personal projects, such as the recent Man on Earth, held a solo exhibition in the US, and even written a book on the subject: Light Work: How to Master Light in Street Photography. Given his expertise in chasing light, StreetHunters invited Rupert to speak on the subject. 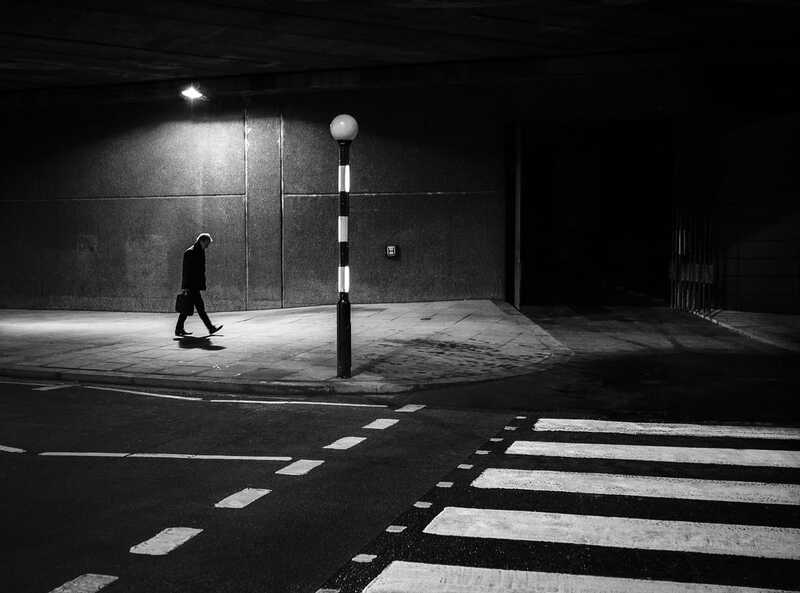 Here are his top five tips for lighting the streets. Is it true you only shoot from 9 till 11, April till March? What quality of light are you looking for and why do you find it between these hours? People often ask what is it that inspires me to pick up my camera and produce a body of work. In pure photographic terms, it’s how the light affects the city and its environment. With different times of day come different moods. I like how cool and clear the light can be in the morning, creating sharp lines of shadow and jewel-like highlights. It penetrates the space between the towering buildings and generates a dazzling display of intricate patterns on every surface. Your high contrast style appears to work equally well in night scenes. What are the benefits and challenges of working at night? and if it’s raining there are wonderfully reflective surfaces to work with. The main thing to remember is to try to work in areas that offer good main light sources. 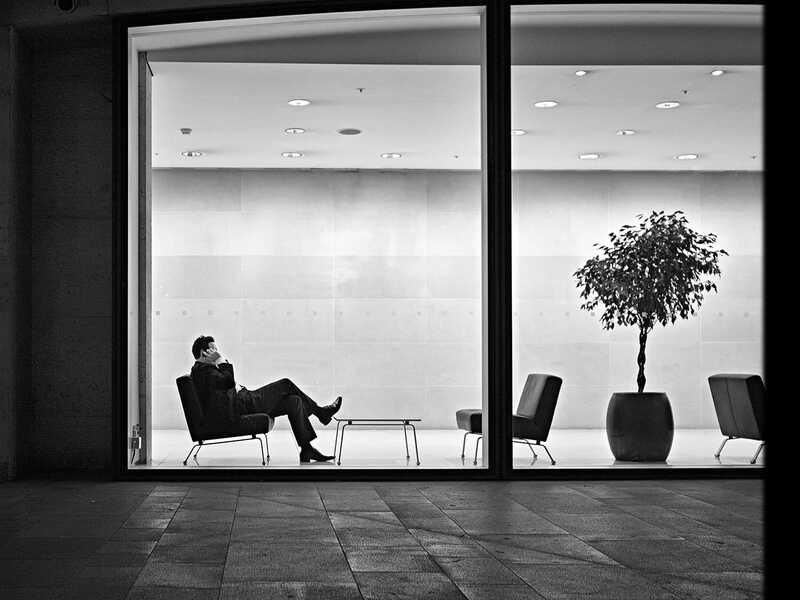 This will make it much easier to isolate your principal subject and any additional lighting coming from shop windows or passing traffic will add to the mood and create a little decoration if required. One thing to remember is that the amount of detail you capture is likely to be a lot less than when you’re shooting during daylight and human figures will often appear as silhouettes. Therefore, it’s important to try to represent them as animatedly as you can so that they don’t just become a featureless blur. Street Photographers often forget interiors. What interior lighting would you recommend? In what ways is the quality different from natural light? 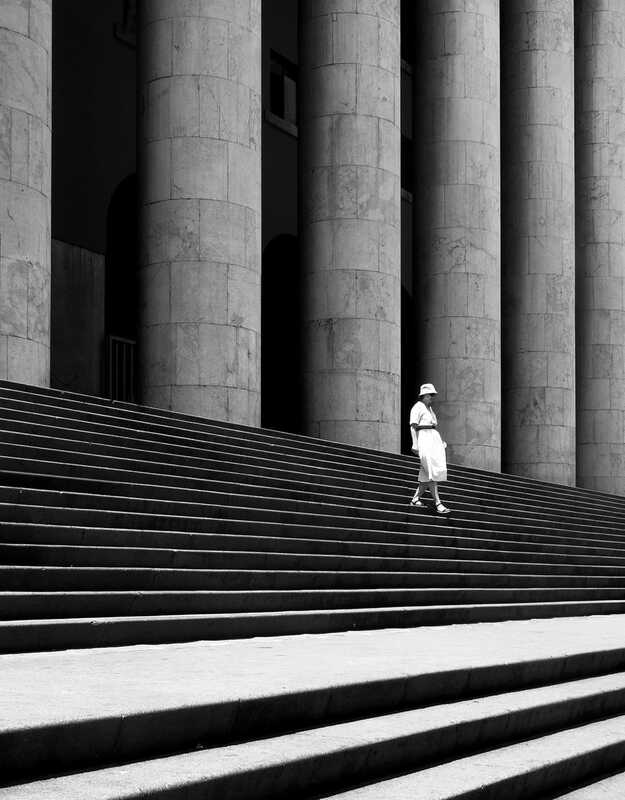 Street photography doesn’t always have to mean taking pictures on the streets. I have often included pictures in my series of interior spaces that perfectly sum up the life of the city. the perfect places to capture the city’s inhabitants taking time out from the energy and buzz of the streets. The light in these places is often quite good too as they usually have large windows allowing daylight to penetrate deep into the space. At night, the light is more subdued but no less inspiring. There is always a fine array of characters to be found so you shouldn’t be stuck for a subject or two. Light can also reflect and refract. 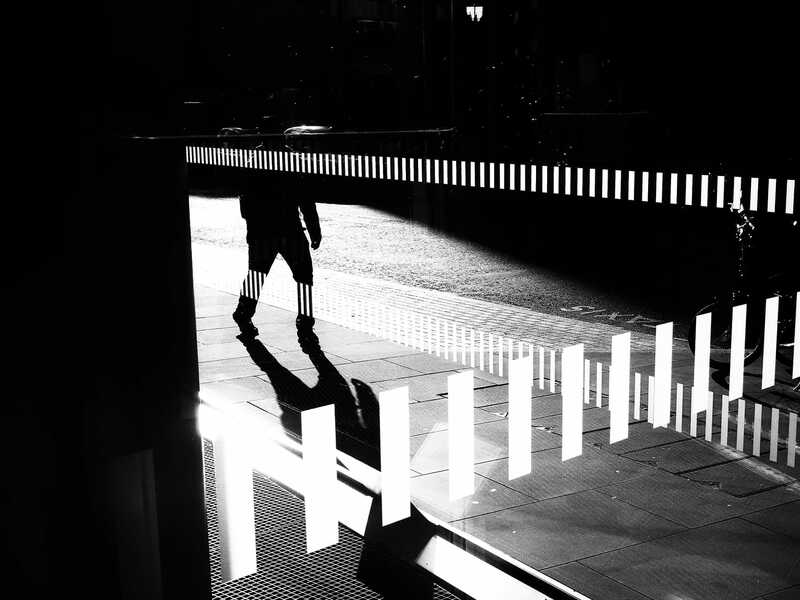 What reflections do you use on the street and how can they develop your composition? 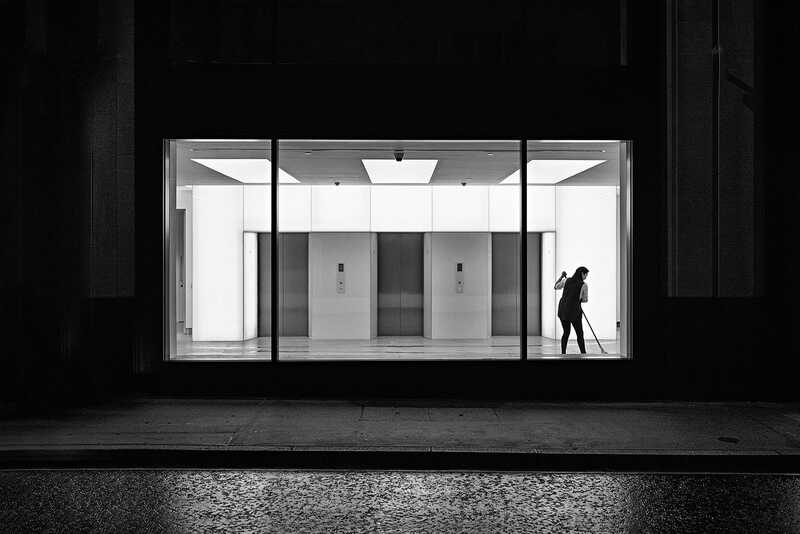 With all the glass, steel and polished surfaces used to construct our modern cities, the one thing we can be sure to find on our travels is a plentiful supply of reflected light. brush and painted long white strokes across the scene. A high sun on a clear day will provide the best lighting for this effect, making the reflected areas as bold as possible against the darker areas. Are there situations in which you would use flat lighting? What qualities can two-dimensionality add to an image? There are times when I want to get a picture but the light isn’t right and for me this can mean having to be extra creative. The high-contrast style will still work in flat-light conditions but you’ll be looking for the extremes in black and white in different ways. These may be found in the form of naturally occurring elements in the scene such as road markings or contrasting architectural details. You need to think along the same lines as when working in bright conditions and look for the highlights and shadows. As Rupert finishes his coffee, we find the time to ask him about his future projects. He describes a world where the human form has disappeared entirely: reduced to hands, feet and the pockets of light surrounding them. One has to wonder how far this is pushing the definition of street photography. 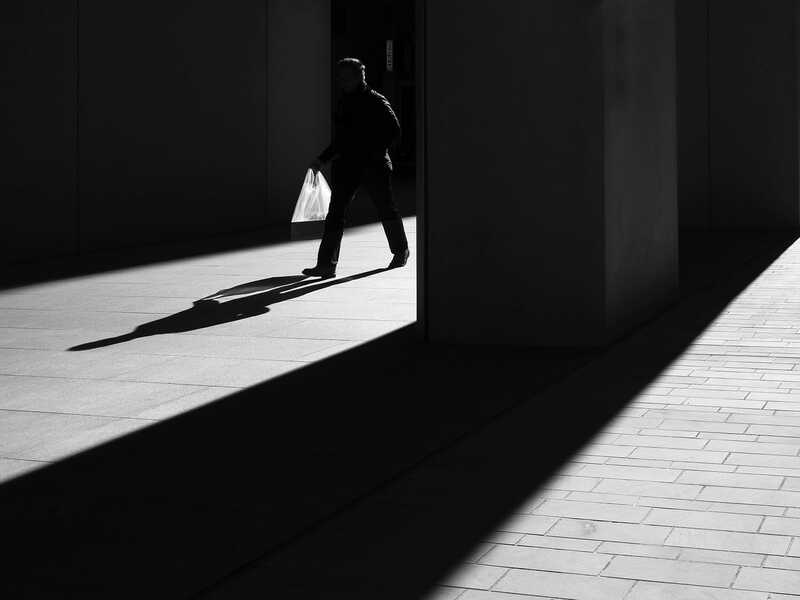 To what extent can we photograph a street without a subject? 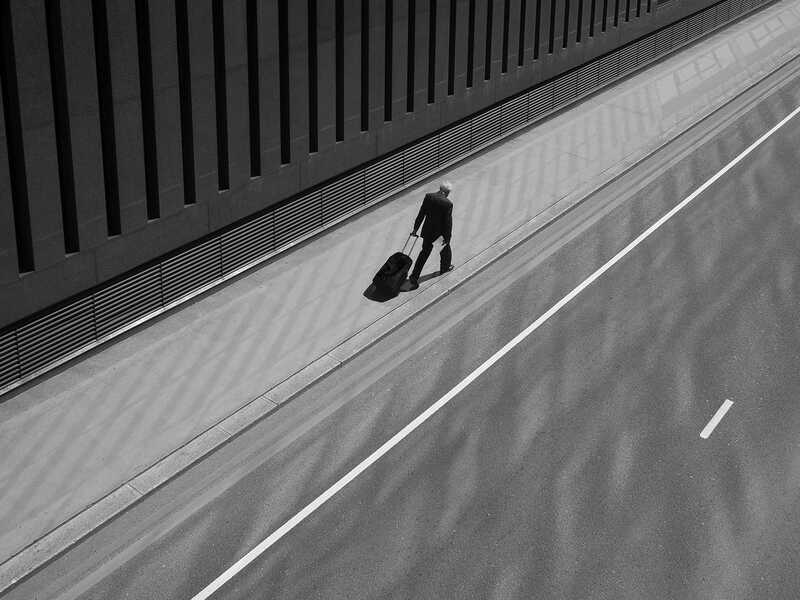 To what extent can we photograph a street without a street? But this is precisely the point of Rupert’s work. So much of street photography wants to reflect the world, to document its day to day life, to record all of the minutiae detail and preserve the everyday facts of the world. But Rupert’s work doesn’t strive to reflect the world at all. In fact, it strives to change it. Timothy Lunn is a Multimedia Journalist based in London. He is working on a series of interviews with leading street photographers for Streethunters.